New research by a team of scientists and archaeologists based at the Weizmann Institute of Science and the University of Copenhagen suggests that the 15,000-year-old ‘Natufian Culture’ could live comfortably in the steppe zone of present-day eastern Jordan - this was previously thought to be either uninhabitable or only sparsely populated. The hunter-gatherers of the Natufian Culture, which existed in modern-day Israel, Jordan, Lebanon and Syria between c. 14,500 – 11,500 years ago, were some of the first people to build permanent houses and tend to edible plants. These innovations were probably crucial for the subsequent emergence of agriculture during the Neolithic era. Previous research had suggested that the centre of this culture was the Mount Carmel and Galilee region, and that it spread from here to other parts of the region. The new study by the Copenhagen-Weizmann team, published in Scientific Reports, challenges this ‘core region’ theory. 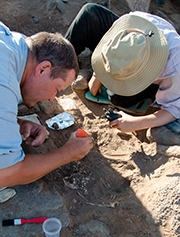 Archaeologists working at the Shubayqa 1 site. Click on the image to download a larger version. The new paper is based on evidence from a Natufian site located in Jordan, c. 150 km northeast of Amman. The site, called Shubayqa 1, was excavated by a University of Copenhagen team led by Dr. Tobias Richter from 2012-2015, funded by grants from the Independent Research Fund Denmark, the Danish Institute in Damascus and the H.P. Hjerl Mindefondet for Dansk Palæstinaforskning. The excavations uncovered a well-preserved Natufian site, which produced a large assemblage of charred plant remains. 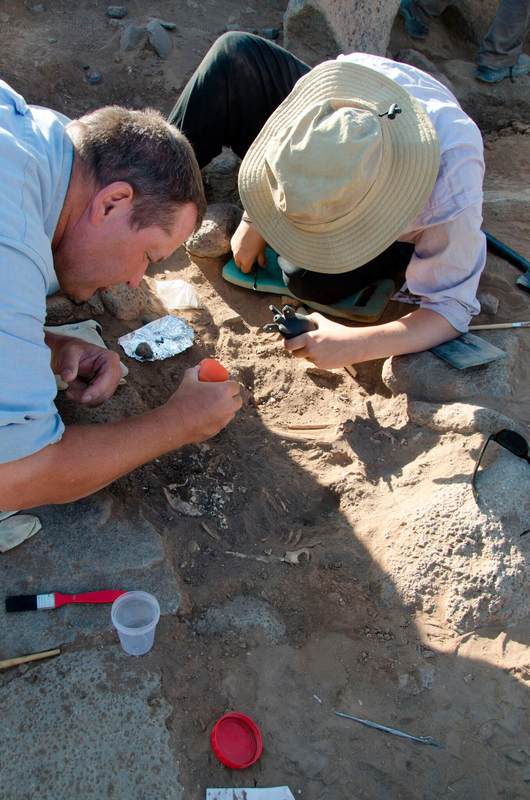 These kinds of botanical remains are rare at many other Natufian sites in the region, and enabled the Weizmann-Copenhagen team to obtain the largest number of dates for any Natufian site yet in Israel or Jordan. “The early date of Shubayqa 1 also shows that Natufian hunter-gatherers were more versatile than previously thought. Past research had linked the emergence of the Natufian to the rich habitat of the Mediterranean woodland zone. But the early dates from Shubayqa show that these late Pleistocene hunter-gatherers were also able to live quite comfortably in more open parkland steppe zones further east. Some of their subsistence appears to have relied heavily on the exploitation of club rush tubers, as well as other wild plants. They also hunted birds, gazelle and other animals,” says Tobias Richter. The dating was undertaken by Professor Elisabetta Boaretto at the Weizmann Institute of Science using Accelerator Mass Spectrometry, or AMS, dating. Boaretto is head of the D-REAMS lab in the Weizmann Institute – one of the few labs in the world that works with the technology and methods to analyze even the smallest organic remains from a site and precisely date them. Using a specially designed mass spectrometer, Boaretto is able to reveal the amount of carbon-14 in a sample down to the single atom. Based on the half-life of the radioactive carbon-14 atoms, the dating done in her lab is accurate to around 50 years, plus or minus. For the analysis of the specimen from Shubayqa, the team was able to select only short-lived plant species or short-lived plant parts, such as seeds or twigs, to obtain the dates. This ensured the highest possible accuracy for the dates. Boaretto says that the “core area” theory may have come about, in part, because the Mt. Carmel sites have been the best preserved and studied, until now. In addition to calling into question the idea of the Natufian beginning in one settlement and spreading outwards, the study suggests that the hunter-gatherers who lived 12,000 to 15,000 years ago were ingenious and resourceful. They learned to make use of numerous plants and animals where ever they were, and to tend them in a way that led to early settlement. The research is funded by Independent Research Fund Denmark, Danish Institute in Damascus, H.P. Hjerl Mindefondet for Dansk Palæstinaforskning.